Microsoft has pulled on the oven gloves to bake new functionality into its Office Online suite, which was recently outed as a replacement for its cloud-based Web Apps. 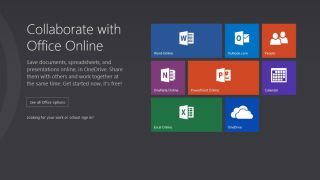 Spreading its productivity tentacles further following the launch of Office for iPad, the company has now made its online versions of Word, PowerPoint, Excel and OneNote available as Chrome Apps that can be launched from the browser's desktop-based App Launcher. As detailed in a company blog post, Word Online now allows comments to be added to documents, bringing it in line with arch-nemesis Google Docs. They're displayed in a comments panel that lets colleagues aim subtle jibes (or y'know, compliments) at each others' work, with comments indicated by margin markers. Lists aren't new in Word Online, but they're getting some improvements in the form of auto-numbering to make them more intelligent and better distinguish between old and new lists. Some simple options have been added to a context menu for starting new lists, continuing old ones, or setting the number value. Footnotes and endnotes are back with a bang, and Microsoft has restored them with a twist: a new web-first approach to make footnotes and endnotes easier to add, edit and see without leaving your place in the document. Excel Online has also been kitted out with commenting functionality. Another feature brought over from Word Online, called Tell Me, lets you ask the service how to do something, which brings up answers in the form of interactive commands activated by hovering around in drop-down menus. In PowerPoint Online, the text editor has been re-engineered to make editing slides look more like the final result, according to the blog post. Performance and video playback has also been optimised to speed up advancements of slides in the editor, it says, and embedded YouTube videos can now be played back. Last but not least, OneNote Online has introduced one-click printing from within notes. Don't all rush back on it at once, now.